President Trump’s first State of the Union address Tuesday night will focus on several hot-button political issues. Foremost among these is immigration reform, as Trump will reportedly use tonight as an opportunity to sell his immigration plan to congressional Democrats, who so far have proved resistant to the president’s proposal for DACA amnesty in return for border wall funding and increased restrictions on legal immigration. Additionally, Trump is expected to flesh out details for a new trillion-dollar infrastructure-spending bill, which will be a major legislative focus for him in 2018. 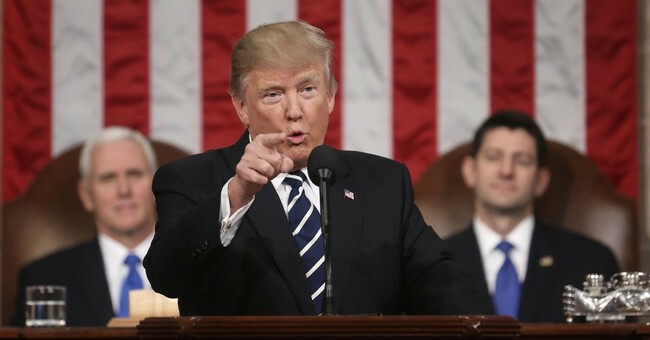 Trump will also likely use his speech to make the case that Republican legislative and executive policies over the past year have led to substantial economic benefits for working-class Americans and businesses. Watch the speech below starting at 9 p.m. and follow along with the Townhall Media team on Twitter.